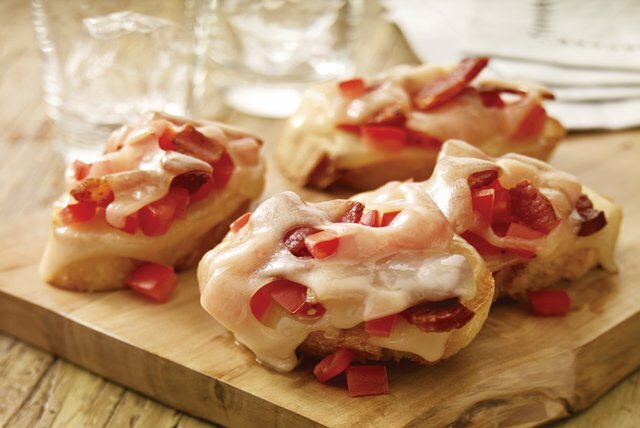 Garlic, plum tomato, bacon, mayo—these and more good things make our Cheesy Bacon Bruschetta a surefire Friday night hit. Cook and stir bacon in skillet on medium heat 12 min. or until browned. Remove from skillet with slotted spoon; drain on paper towels. Spread bread with mayo. Broil, 4 inches from heat, 1 to 2 min. or until toasted; rub with garlic. Cover toast slices with 4 cheese pieces, bacon and tomatoes. Top with remaining cheese pieces; broil 1 min. or until melted. If you don't have a fresh garlic clove, sprinkle toasted bread slices lightly with garlic powder before topping with cheese, bacon and tomatoes. Broil as directed. Prepare recipe as directed. Add to hot filled bowls of French onion soup.